June is acne awareness month. 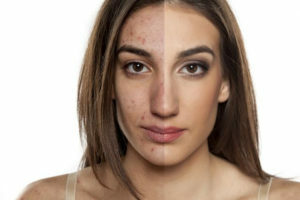 Unfortunately, for those that suffer from acne, you are painfully aware of it the other eleven months of the year as well. Many patients affected by acne are not sure where to start in terms of treating their skin condition. With the abundance of topicals, laser acne treatments, facials and peels it can be overwhelming to form your own plan of “acne attack”. At Dermatology & Laser of Del Mar, we specializes in the treatment and prevention of acne and acne scarring. We focus on the most effective treatments for you, all year long, not just the 30 days defined as “acne awareness”. The first step toward your treatment plan is to schedule an appointment in our specialized acne clinic. Based on your skin type and severity of your acne, we will help you choose the regimen and treatments best suited to your personal needs. * Smoothbeam laser for the treatment of acne and acne scarring. This non ablative laser selectively targets oil glands, shrinking them and decreasing the production of oil. With less oil there will be less acne causing bacteria and your breakouts will be diminished. Smoothbeam laser also stimulates collagen remodeling, “lifting” depressed scars and healing them from the inside out, and shrinking enlarged pores. * Blu-U-Light therapy to reduce acne causing bacteria. * Medical grade skin care products and oral supplements designed for at-home maintenance. Contact us today to schedule your initial skin assessment. It’s the first step to clearer, healthier skin.